It was a rainy start to the first annual Make a Mess For the Kids, but it did not stop students from painting campus leaders on the bell tower patio Tuesday afternoon. Make a Mess For the Kids was an initiative to raise awareness for Up ‘til Dawn, an event that will take place later this year, said Mare Rote, an executive board member for the event team. 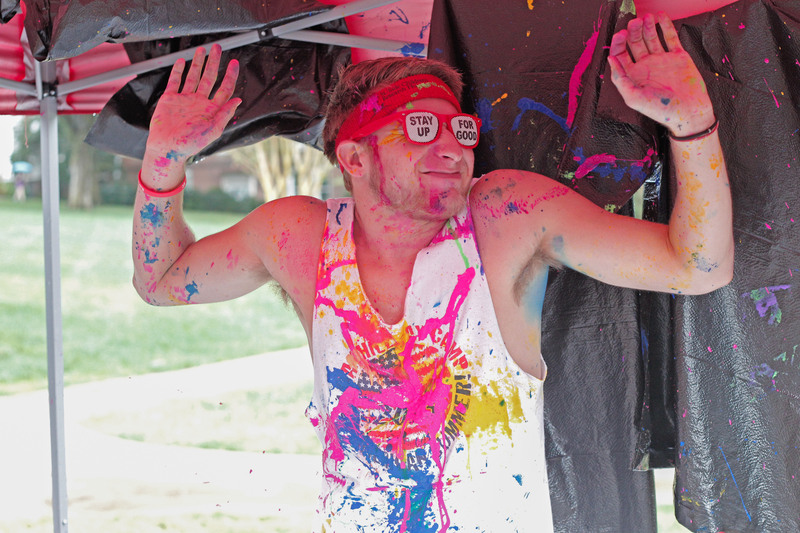 Students had the opportunity to sign up for Up ‘til Dawn and in return got to spray paint on campus leaders with syringes of different colors. According to St. Jude’s website, “Up ‘til Dawn is a student-led, student-run philanthropic program” that raises funds for the research hospital. St. Jude Children’s Hospital created Make a Mess For the Kids in honor of national recruitment day, said Rote. According to Belmont’s St. Jude fundraising page, they have raised $25,892. Up ‘til Dawn will be held on Jan. 29, 2016 and run through Jan. 30, 2016; so far, 250 people have signed up, Rote said. For more information or to sign up for the event visit St. Jude’s fundraising site. Article and photos by Wes Hight.